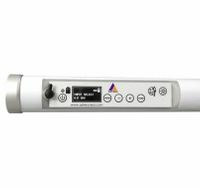 The Astera Titan LED Tube is available for rent in CT at BarnDoor Lighting Outfitters. 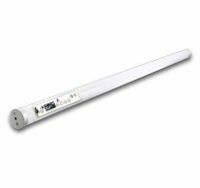 The Astera LED Titan Tube provides 72 watts of ultra high TLCI flicker-free light, perfect for film, video and photo production. 16 pixel segments, 180 degree beam angle, IR, App controlled, wired and wireless (CRMX) DMX and built-in rechargeable LG battery. The Titan is IP65 rated (waterproof) for use inside or outside. Plus green / minus green control. The Titan will run up to 20 hours on battery power with a 3 hr re-charge time. 2hr Boost Mode 2.8 X the brightness in white for almost 2hrs (compared with AX1). Onboard Control / Display. Quick access to DMX setup, colors and hue, saturation, intensity control. Talkback+: Detect all available lights, set them up, check their status, configure DMX addresses and DMX profiles. Seamless Runtime: Set the length of your production and be sure that your lights won`t run out while still getting the maximum brightness. TruColor Calibration: Individually calibrated lights lead to 100% color consistency and exact color reproduction of color temperature and filter gels. Effects: Quickly build programs out of colors and effects, trigger them or make them match a beat. Flicker Free Scrambled PWM technology to avoid flickering when filming. Green/Magenta Correction: Adjust green/magenta during content creation to reduce postproduction work. Scheduled StandBy: Switch lights into power-saving standby and schedule them to wake up when the production starts. Dynamic PowerBoost: This exclusive feature makes the light able to display the maximum brightness at all time and intensify non-white colors. Emergency Lights: Switches to white light when AC power is cut to keep your event save. Anti-Theft: The lights give visual and audible alarm and send notification to the AsteraApp if they are being moved during an event. DJ Feature: Auto BPM analyzes the beat and matches programs to it, flash buttons can trigger special effects while being held down. Other Features: The AsteraApp� is packed with many additional items and new features are frequently added via software update.